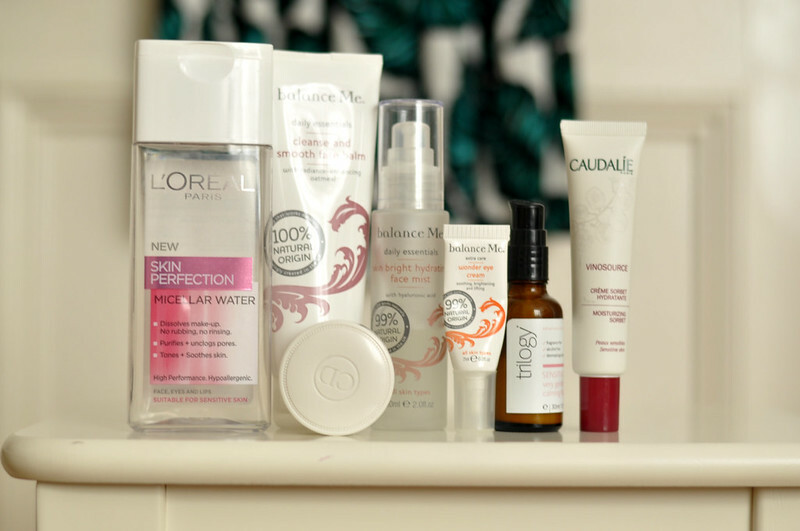 L'Oreal Micellar Water // balance Me Cleanse And Smooth Face Balm // balance Me Skin Bright Hydrating Mist // balance Me Wonder Eye Cream // Trilogy Calming Fluid // Caudalie SOS Moisturising Sorbet // By Terry Baume De Rose. This months skin care is pretty boring as it's basically all the products I was using last month. I'm really trying to stick with the same products until they're empty as I find with my skin consistency really is key. I'm still using the same tube of balance Me Cleanse & Smooth which I'm shocked about as I really thought It would run out at the start of the month after only one or two uses. The same goes for Caudalie Moisturising Sorbet, after using it everyday this month I'm surprised it has ran out already. Balance Me's Hydrating Mist has been a life saver when we had the week of really hot weather as it helped to keep me cool as well as soothing my skin if it was a bit irritated. You've got some really lovely products here, I love the Balance Me balm and Caudalie Sorbet. I love the sound of the Trilogy Calming Fluid, I've always been really impressed with everything I've tried from them. New follower here! Some really nice products, I've never heard of a lot of the brands! I haven't heard of 'Calming Fluid' all I know from Trilogy is their Rose Hip Oil!